GOOD MORNING my creative friends & welcome to another "Thrifty Thursday"! If you are new to my blog, on this day, we all try to use up our scraps that we may have laying around our craft room! Okay, before you go….I have a SUPER TALENTED "Guest Designer" for you today! Please meet Miss Melisa w/Melisa's Crafty Creations! 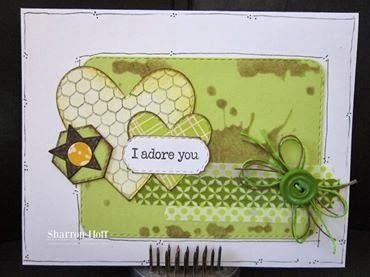 She created this ADORABLE box using my "Fun Gift Pocket Sentiments"! Please visit her blog HERE to see more pics of her FABULOUS project today! Thank you ALL for stopping by! 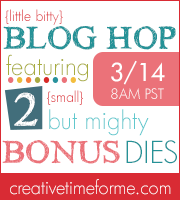 Don't forget to join us for a SUPER FUN "Little Bitty Release" blog hop starting tomorrow, Friday March 14th @ 8am PST! The 2 new items will ALSO be available for purchase at that time as well in my store here! Good Morning Miss Emma I love your treat bag it's so cute and once again you've done something different with your goodies out of context with your treat slider box just adorable and you know you are full of crafty surprises never, ever would've thought to do a green candy kiss I love it, love it allot you really are the most clever and creative person coming up with something so cool and different all the time. Thanks always for what you do and how you do it. So can't wait for tomorrow.....see you here at 8:00 a.m. PST. Super CUTE treat bag Emma!!! I just LOVE that glittery kiss!!!!! More amazing projects from the DT as well!!!!! So looking forward to tomorrow!!!! Adorable treat topper Emma...LOVE. Fab guest spot Melisa!!!! Oh Emma ~ this is sooooo CUTE! I LOVE green glittery chocolate die but using the vellum and stamping the sentiment in blue ~ so CLEVER and ADORBS!! Well the ladies did it again ~ AWESOME projects! So glad Melissa could guest DT too! Super cute treat holder, Love this idea:) I tell you, you always inspire me:) thank you! DT fabulous job, thank you for sharing. Melissa super cute treat box. Congrats on being guest designer! Cute treat topper! You and the wonderful Design Team had some great projects using your scraps. Super job everyone. Love your glittery, green chocolate kiss. The vellum strip with the blue sentiment is perfect. The DT did an awesome job on their cards. Looking forward to the mini blog hop tomorrow, and the two new must haves!